My music wall is done! … for now. I have a feeling it’s the sort of thing I’ll be adding to as I find fun noisemakers. I also have more space leftover than I thought I would so there is plenty of room for more fun. You can see that I made a sort of xylophone from cardboard tubes, a set of chimes from metal computer parts, and a shaker from a plastic egg in a macrame holder. A metal bar on the bottom gives new standers a place to hold on and also makes a great noise when hit with a drumstick. A utensil holder from Ikea gives us a place to store extra instruments. I hung a piece of posterboard as a backdrop so we won’t damage the wall and made a simple frame from furring strips (leftover from the nightstands project). They are screwed into studs so the whole thing won’t come down when the babies try to climb it. – The message of the Scrap Exchange is that one man’s trash is another man’s art, but I think one man’s trash can also be another man’s fun toy. – Kittens like music walls, too. The music wall will be put to the real test tomorrow when the baby comes over. I’ll try to get photos or a video of it in action! I bought a whole load of stuff from the Scrap Exchange yesterday. I had a vague idea of some things that I wanted, but mostly I wandered around sticking my hand into the barrels and banging things together to see what had the best sound. I bought a few of those cardboard tubes you see above and will cut them down to try to get different tones out of them. I also need to punch holes in some bottlecaps and figure out how to hang a plastic egg without little hands pulling it open. Once I get the prep done the music wall should come together quickly. Check back! This rag rug is coming along slower than I thought it would. 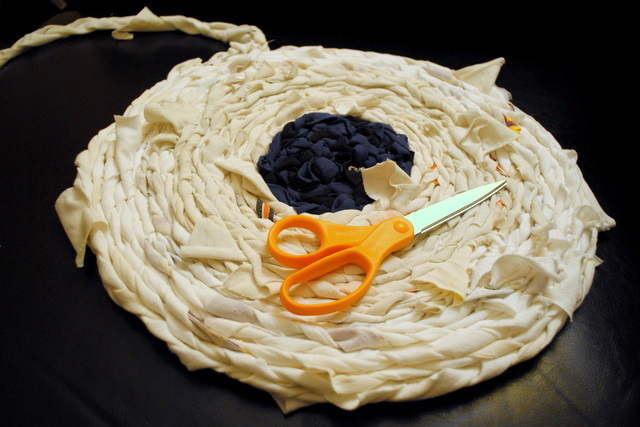 Last week I happily cut up a few of my old t-shirts and braided them together to make a long rope. The last step is to sew them into a coil, and I predict this is where I will be for a while. It’s not easy to get a needle through all of those layers! I’ve bled for this project several times now and it’s not remotely close to big enough to replace my bathmat. I’ll persevere, though, and one day I will have a nice, cushy rag rug and more space in my t-shirt drawer. Photo by me, scissors for scale. This week, with unfinished projects all around me, I’m starting on something that I really need in my house: a music wall. I care for children in my home during the week. We generally stay in one room, but now that they are becoming mischievous toddlers I need to figure out how to creatively use my space. My hallway would be perfect for a music wall. I have grand ideas that go beyond hanging pots and pans on the wall, like you see above. If that was all I needed I’d just let them loose in my kitchen. This week I’m going to go back to the Scrap Exchange and see what great materials I can find to repurpose into a music activity wall for kids. 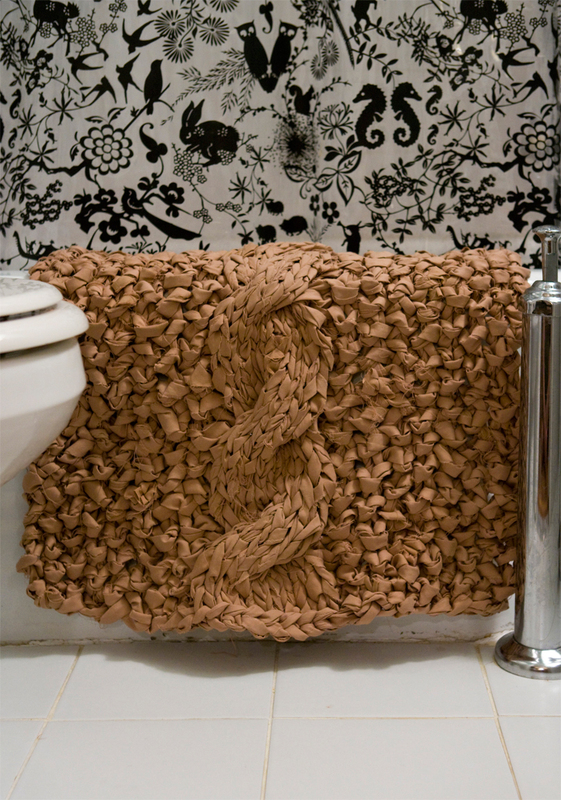 Curious about the rag rug? My aching fingers will post an update with a photo later today. It’s coming along! Last weekend I had the opportunity to work on a couple of projects for other people that aren’t part of the list for my blog. It was fun to take some of my new skills and use them to gift friends with handmade stuff. Hm, can I can call machine embroidery handmade? 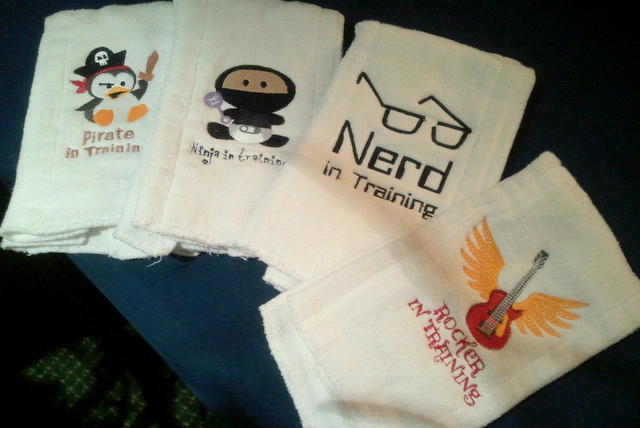 First, I used the embroidery machine to make these fun burp cloths for a baby shower gift. The patterns are from the always awesome Urban Threads. 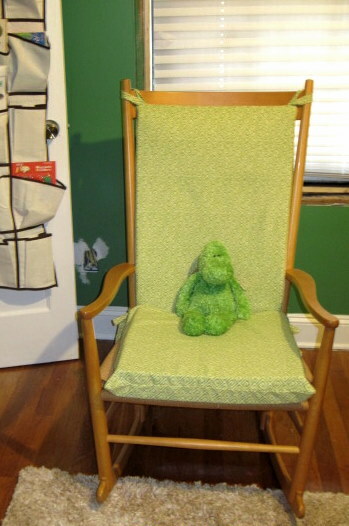 Then on Saturday night I brought my sewing machine to a friend’s house so we could make cushions for her rocking chair. This was the first time I’d completely improvised a sewing project and I am pleased with how it turned out. This comfier chair is ready to rock a new baby to sleep! With each technique I learn as part of this blog project I add a new set of fun gift ideas to my crafting arsenal. I’m excited to put more of these skills into practice. You are currently browsing the 50firstcrafts blog archives for July, 2011.